Want to know all about chinchilla colors? You’re at the right place. Chinchillas are known for their incredibly soft fur. Luxuriously thick, warm, and soft, chinchilla fur comes in several different colors besides the commonly seen Standard Gray. 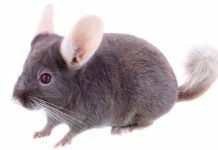 Chinchillas have only been available as pets since the late 1920s, and breeders have come a long way since then. We’ll explore some of the history behind the chinchilla coat, and how breeders produce different color chinchillas. We’ll also note how careful chinchilla breeding may create even more new colors in the future. Chinchillas now come in a variety of colors, but wild chinchilla have mottled, yellow-gray coats. This helps them blend in with their natural habitat in the Andes mountains, where they live in burrows or rock crevices in the relatively barren landscape. All of the chinchilla colors we see today are genetic mutations descending from this color. Domestic chinchillas in the U.S. are actually descendants of just 13 chinchillas brought to the States in 1927. 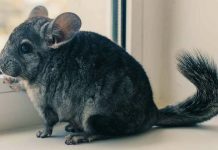 Selective breeding has changed the color of chinchillas from yellow-gray to a range of colors including white, beige, black, sapphire, violet, charcoal, and velvet, but the most common color is a dark blue gray. This blue-gray is the dominant color in chinchillas. Beige, white, and ebony are also dominant color patterns, while sapphire, violet, charcoal, and velvet are recessive. Your chinchilla’s eye color is also dependent on their coat color. 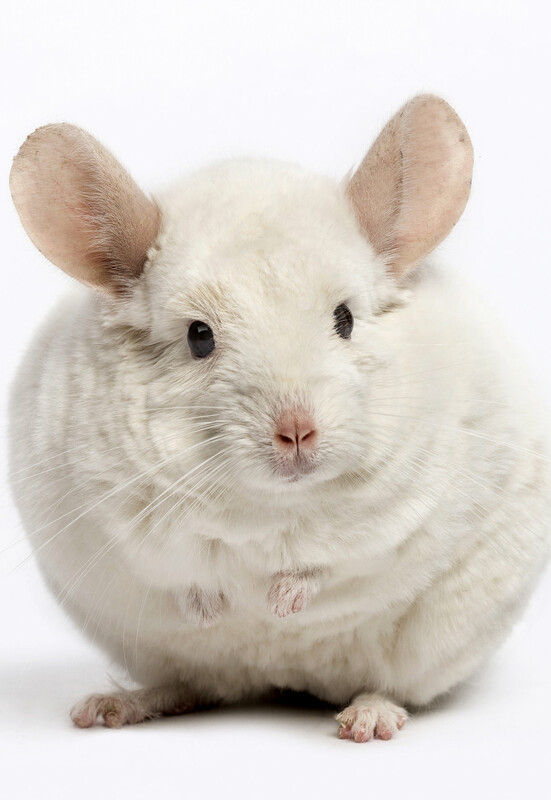 Chinchilla eyes can be black, pink, or red, depending on how their genes express themselves. Have you ever wondered how different chinchilla coat colors happen? The answer is in their genes. The genetics behind chinchilla coat colors get complex quickly, but the basic concept can be understood using two types of genes. Simply put, some coat colors are dominant, while others are recessive. Two dominant or two recessive genes is a homozygous pairing, while a dominant and recessive pairing is heterozygous. A heterozygous pairing will usually express the traits of the dominant gene. A homozygous pairing will usually only produce the single trait. If you remember taking biology in high school, you may have learned about Punnett squares. These squares are used as a teaching tool to illustrate what happens when two pairs of genes come together to create a third. The dominant gene is referred to with a capital letter (A) and the recessive with a lower case (a). Let’s look at a white chinchilla. White is a dominant color, but the chinchilla could be carrying a recessive gene from one parent for another color, like sapphire. If the white chinchilla (Aa) is bred with a homozygous sapphire chinchilla (aa), then the odds are good that some of the offspring of the white chinchilla will be sapphire, despite white being the dominant color. Lighter colors, like sapphire, have been further mutated from the natural color by a mutated allele that causes dilution. This dilution mutation lightens black pigment, creating a blue color. Unfortunately for those of us who struggled with biology, dominant and recessive genes are not the only factors that come into play. There are only two pigments a chinchilla can express: black or yellow. White is actually the absence of pigment, which is why chinchillas with white coloring often have red or pink eyes. These genes determine how those pigments are expressed, to what degree, and where. They are the reason some chinchillas have fur that expresses different colors and patterns at the same time. This also explains why most chinchillas have a shaded appearance, like the color beige, while others are a solid color, like a homozygous ebony or white. As we already mentioned, the most common color found in chinchillas is a blue-gray color. This color is called standard gray and is what most people picture when they think of chinchillas. Breeders, however, often produce a variety of colors, some of which are quite rare. In addition to white, beige, ebony, sapphire, violet, charcoal, and velvet, some breeders also produce chinchillas with patterns like touch of velvet, silver and white mosaic, golden mosaic, white sapphire, white violet, black velvet, brown velvet, and goldbar. These colors can usually only be found in chinchillas from an experienced breeder, but you may find them at a chinchilla rescue, too. If you’re a chinchilla enthusiast who appreciates rare colors, you’re in luck. 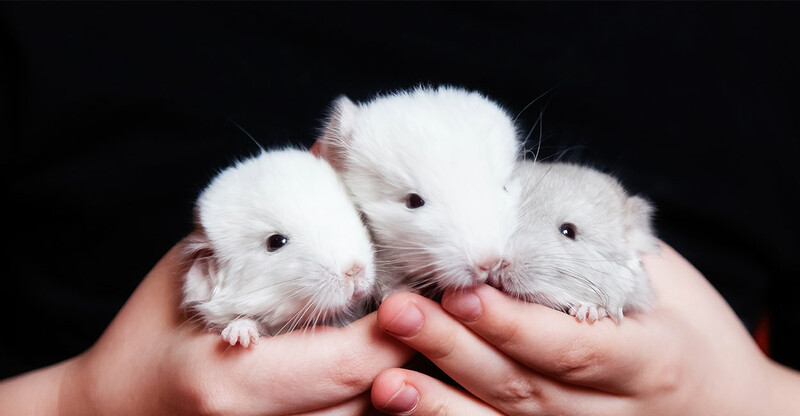 More chinchilla coat colors will undoubtedly arise as breeders continue to experiment with different crosses, giving you plenty of new possibilities to look forward to. What colors do chinchillas come in? Let’s take a look at some of the chinchilla fur colors you might see. 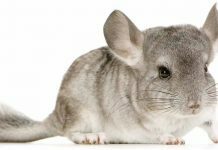 Standard Gray: Standard Gray chinchillas have a white underbelly and dark gray coloring on the spine and sides. If you examine a single hair, you will notice that the tip is black, the middle is white, and the base is a blue-gray. White: White chinchillas come in a variety of different mutations. White chinchillas can be all white. Or, they can be crossed to create other combinations, like White Sapphire or Ebony White. Depending on the cross, white chinchillas can have black or ruby eyes. Heterozygous beige: Beige chinchillas have a dark beige coloring down the spine, which fades to a lighter beige along their sides. They have white underbellies and ruby eyes. Homozygous beige: Homozygous beige is lighter than heterozygous beige and is closer to a champagne color, and their eyes are commonly red. Violet: Violet chinchillas have a slight purple hue and white underbellies. Their fur has no black tipping, which gives them a soft look, but their eyes are black. Sapphire: Like violet, sapphire chinchilla coloring lacks the black tip common to other colors, giving them a soft, blue coat, white underbelly, and black eyes. Ebony: Homozygous ebony chinchillas are entirely black. However, heterozygous ebony chinchillas, can have touches of gray within the coat. Not surprisingly, their eyes, too, are black. Charcoal: Charcoal chinchilla fur ranges from gray to black, with a matte appearance, gray underbelly, and black eyes and ears. Touch of Velvet: Touch of Velvet is the term used to describe chinchillas with a “veiled” appearance. These chinchillas have a dark shade across their face that runs down their spines to their tails, gray sides, and a white underbelly. They also have black eyes. Chinchillas come in a variety of colors, with breeders producing new combinations over time. Some of these colors are rare, while others, like Standard Gray, are quite common. With a basic understanding of genetics, you can navigate the world of chinchilla colors to better understand your pet. Just remember that no matter the color, your chinchilla still needs access to dust baths, a healthy diet, and a calm, clean, quiet living environment. Fontanesi, L. et al (2013). A frameshift mutation in the melanophilin gene causes the dilute coat colour in rabbit (Oryctolagus cuniculus) breeds. Animal Genetics. Covrig, I. et al (2013). The C locus: rabbit genetics for full color development, chinchilla, seal, sable, pointed black and red-eyed full white. International Journal of the Bioflux Society. Lehner, S. et al (2013). Two-Exon Skipping within MLPH Is Associated with Coat Color Dilution in Rabbits. PLoS One. Donnelly, T. Chinchillas. Merck Veterinary Manual.